When I worked as an Occupational Therapist with pediatrics, I did a ton of work on scissor skills and pre-scissor skills. It was one of my favorite things to work on with school-based kiddos. 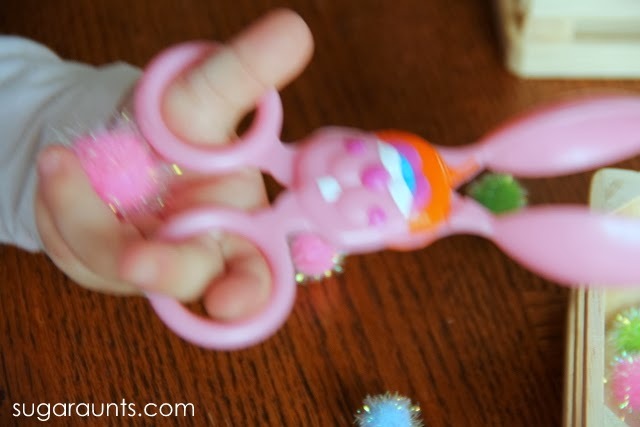 There was an item in my therapy bag that I (and the kids) LOVED for scissor practice. Now being at home with my own kids, it's so much fun to pull out my OT stash of supplies and play. We pulled out a few things recently and the kids had a blast playing. 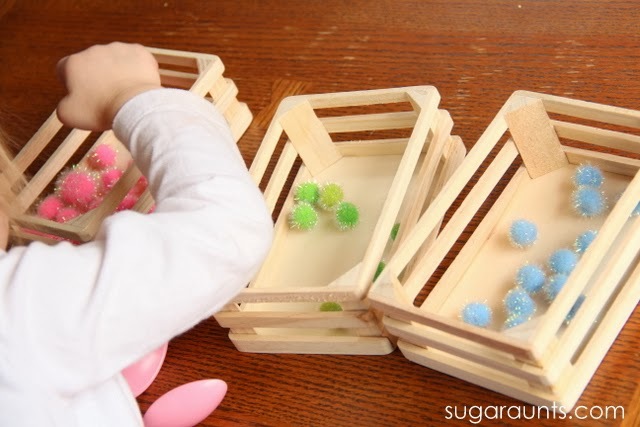 And if you follow this blog, you know we do a ton of fine motor activities! This is the ONE item you want to pick up from the Dollar Store this spring. It's a must-have for OTs working in the schools or with kids on scissor skills. 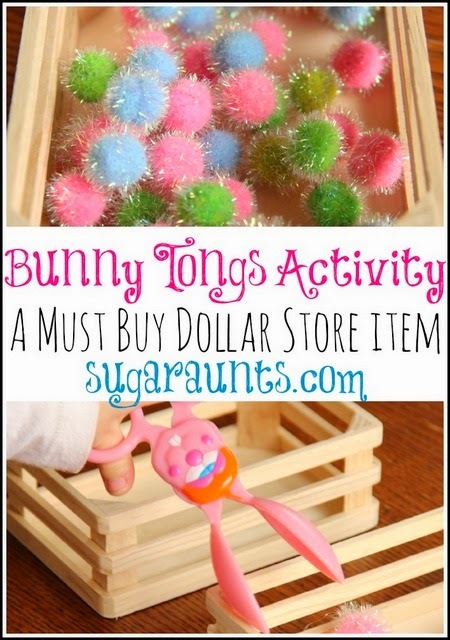 If you see these Bunny Tongs at the store this Spring, GRAB them up! These are awesome for scissor skills and besides being completely cute, they are SO fun to play with. 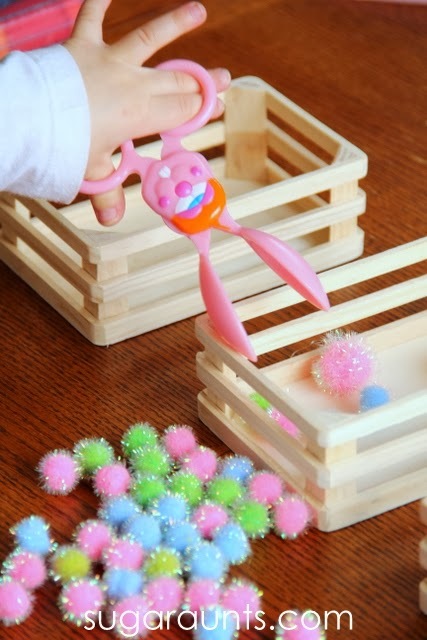 Adorable bunny + working on developmental skills= AWESOME! These bunny tongs are out this time of year because they are really intended for dipping Easter eggs. We've never actually used them for egg dying, but I'm guessing it's a pretty cool way to dye eggs, too. I did find them on amazon , so if you can't find these guys in the store, they are always available online. 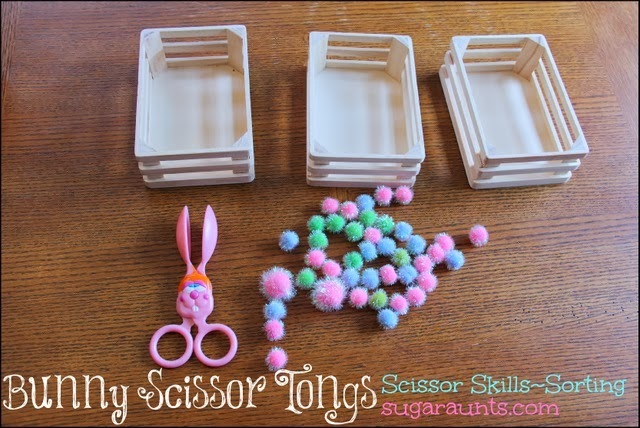 I set up this sorting activity for the kids one day using our bunny tongs. 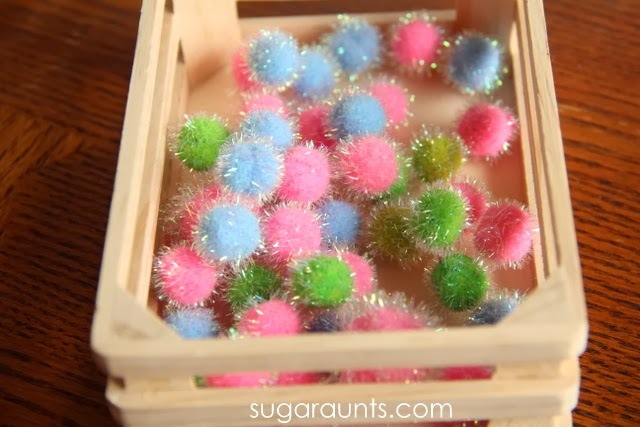 Scissor skills were really worked on with the repetition of picking up lots of assorted pom poms and sorting them into crates. Baby Girl LOVED this activity. She went through and sorted pom poms at least three separate times. You can see how she's got her ring finger and pinkie finger extended out as she opens the tongs in the picture above. This is a great time to work on pre-scissor skills with her, so that as she does start with snipping with real scissors down the road, she maintains an appropriate and effective grasp on the scissors. Not a great picture, but popping a crafting pom pom into the palm of her little hand is a great way to correct that grasp on the tongs (or scissors). This way, the child opens and closes the tongs/scissors with the thumb and pointer/middle fingers in an effective and more controlled manner. This will help with scissor control and line awareness. If you've got a little one who cuts with scissors and snips all over the place, with their pinkie finger and ring finger extended out as they open the scissors, try this trick. You can use any small item like a little eraser or pebble in the palm of their hand. It's a good physical prompt to remind them to keep their hand closed as they cut with scissors. Little Guy wanted in on this action too, and once Big Sister came home from school, she sorted the pom poms too. This was just fun! Baby Girl resorted to just using her hands to sort later in the day. Still great for color matching and identification. we'll definitely be doing this activity again. It was a huge hit for my kids as much as it was a hit for all of the school-based clients I've worked with over the years. It's the cuteness of that bunny! Interested in the items in this post? Follow Sugar Aunts' board Scissor skills on Pinterest.